No longer available from us. Since Nov. 2014 distributed by Rootsy.nu Alligator Gumbo - Simmerin’ monophon MPHCD003, 2014. Alligator Gumbo – unpolished and honest cajun music from the heart! Cajun music is a world heritage that was born and developed with the french immigrants in South Western Louisiana during the 19th century. Alligator Gumbo is a band with it’s roots in South Western Sweden, with their love for music from the South they have devoted themselves for the cajun tradition. With the right instruments and interpretations Alligator Gumbo invite for dancing but also something to enjoy for a seated audience. The lyrics are in ”Louisiana French” – passionate with thematics such as unanswered love, hard living, but of course also the joys of life. “This music makes me want to dance,” said my wife, Pat, when she listened to Alligator Gumbo’s new CD. I first heard about the band a couple of years ago. I was reading news from the “old country” and noticed that a local Cajun band (AG) would perform at the annual festival in Malmö, Sweden. I eventually found a few clips on You Tube, and heard pieces from a self-produced CD with eight traditional Cajun numbers. The music was definitely Cajun and the vocals were sung in Cajun French. Maybe the musical dialect was a little different, but the language was definitively the same. I thought, “why not… why shouldn’t a band of Swedes be able to interpret the music of rural south Louisiana”? After all, one can listen to some great New Orleans jazz in Copenhagen , Denmark, just across the sound from Malmö. A couple of months before this CD was recorded Thor visited Louisiana’s Cajun Country for the first time. He was able to sit in with local musicians at jam sessions in Eunice and Lafayette. It was at these places that he introduced a novelty at the jams, bagpipes. The pipes were played alongside the French accordions and the fiddles, and easily fit the mix. 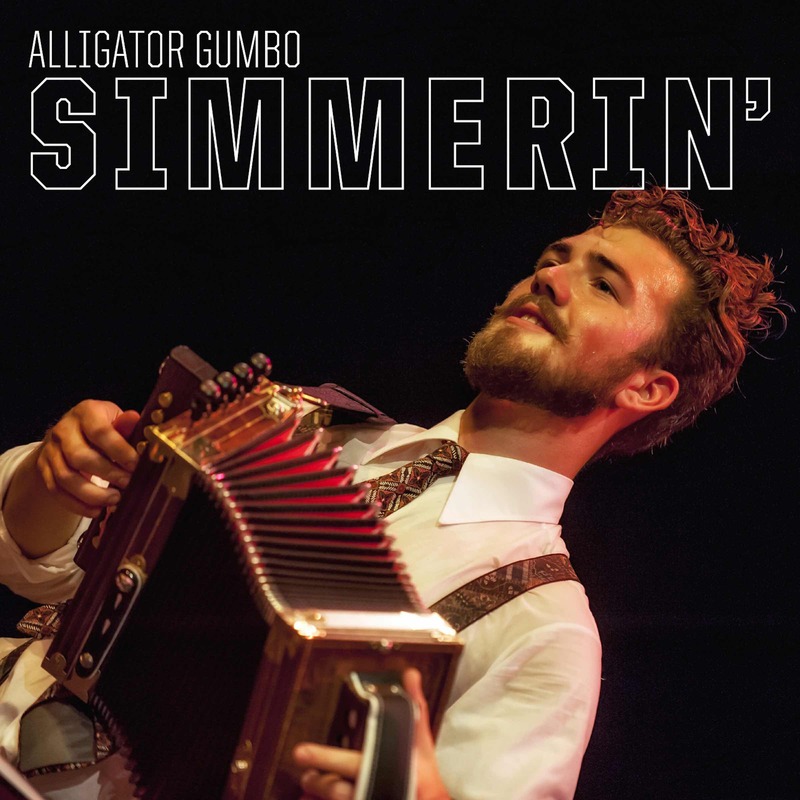 So here’s Simmerin’, Alligator Gumbo’s second album with French music, as the Cajuns call their music. We get twelve tunes. Ten of them are traditional songs. Two of the numbers are Thor’s compositions. Le Long Voyage was written just before he departed on his journey back to Sweden. Cold Cajun was written as an afterthought when he returned to the north. Alligator Gumbo adds bagpipes to their take on the Cajun gumbo on two tracks. The Cajun gumbo is necessarily not hot with pepper, but it’s well seasoned. Thor’s bagpipes add another seasoning to the simmering gumbo pot. Simmerin’ is a good example of the music of south Louisiana. It’s social music, made for family gatherings and other parties. This is how it sometimes sounds on back porches, or at the dance halls here. So let’s boil some crawfish, ice down the beer and let’s dance! Recorded & mixed by Jakob Gustafsson and Per Tidstrand at I/O studios, Malmö, Sweden.